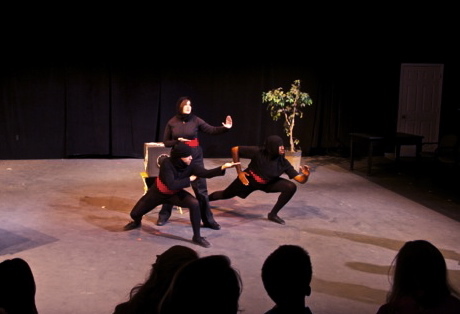 The 8th Annual Ten minute Play Festival at George Mason University provided me with the opportunity to direct the absurdly funny The Ninja Play by student playwright Aaron Sulkin. I was attracted to this piece because of the close ties I saw between words and movement, something inherent, if not expressly stated, in the text. The first challenge was finding the sporadic tempo rhythm of the play; the second was coaxing the actors into understanding it. In the end, I definitely learned how to direct an awkward silence-without it seeming as though the actors had simply forgotten their lines.